Woodlands Juvenile Justice Centre in Bangor is the only custodial facility for children in Northern Ireland. THERE has been a dramatic increase in the number of times children living in care have been detained in Northern Ireland’s Juvenile Justice Centre, The Detail can reveal. New figures contained in an internal presentation hosted by two Stormont departments show that the number of times children living in care were held in custody more than doubled from 2011 to 2013. The presentation was delivered at a joint Department of Justice and Department of Health workshop and also highlighted a growing trend of children in care being sent to the Juvenile Justice Centre (JJC) without being sentenced or convicted of a crime. A leading youth justice organisation says this raises concerns that young people exhibiting challenging behaviour in care homes are being needlessly sent to custody. Reacting to the figures, Include Youth’s policy coordinator Paula Rodgers said that detaining young people living in care can “needlessly criminalise them". She said: “These figures feature young people who are already in a difficult place in their lives and haven’t necessarily been sentenced or convicted of a crime, but are still going straight from residential care to custody. Children in care can also be referred to as “Looked After Children” (LAC). This term describes young people who are in the care of a health trust or are provided with accommodation by a trust. They may be living in residential homes, with foster carers, extended family members or in supported accommodation. Woodlands Juvenile Justice Centre in Bangor is the only custodial facility for children in Northern Ireland. It can hold both children living in care and those not living in care. The presentation obtained by The Detail has highlighted concerns about the circumstances that have led to higher numbers of children being sent to Woodlands. It contains the findings of an audit undertaken by Department of Justice officials earlier this year into bail conditions for young people in Northern Ireland. It was presented in July 2014 by a Department of Health official at a workshop between the Department of Justice (DOJ) and Department of Health, Social Services and Public Safety (DHSSPS). Representatives from organisations such as the Police Service for Northern Ireland (PSNI), the Heath and Social Care Board (HSCB) and the Public Prosecution Service (PPS) were present. Its aim was to highlight issues having an impact on the number of children in care being admitted to custody in recent years. Figures highlighted in the presentation show that while there there has been an increase in the overall number of admissions to Woodlands over the last three years, the number of times looked after children were detained more than doubled between 2011 and 2013. Over the last three years the largest number of young people sent to the JJC has involved young people who are not in care aged between 10 and 17. However we carried out calculations using population estimates for Northern Ireland in 2013. Based on the overall number of children aged between 10 and 17-years-old in Northern Ireland from a non-looked after background, there were two admissions per 1,000 children not living in care to the JJC in 2013. 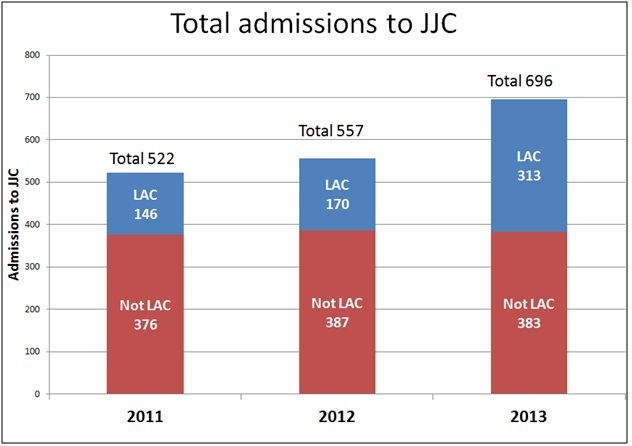 This is in stark contrast to the 112 admissions to the JJC per 1,000 children living in care. (ii)	By police under the Police and Criminal Evidence Order (PACE). In Northern Ireland when a young person is arrested and subsequently charged with a criminal offence, police here have the power to continue to detain the young person under PACE, instead of releasing them on bail. This power is only meant to be used if police decide detention is necessary for the young person’s own protection, to prevent them from committing an offence or if they believe that they will fail to appear at court. When a young person is detained under PACE they can be sent directly to Woodland’s Juvenile Justice Centre. In a statement to The Detail the PSNI said: "PACE provides that police may deny an arrested juvenile bail under certain circumstances. These include protecting the public and the juvenile and also when it is in the best interests of the juvenile. “If detained, the juvenile should be moved to a place of safety unless it is impractical to do so. If this is the case the juvenile may be detained overnight in a police station. Woodlands Juvenile Justice Centre is a place of safety under PACE and is one of a small number of secure places of accommodation for juveniles currently available in Northern Ireland. A series of government commissioned reports in recent years have called for a reduction in the number of PACE admissions to Woodlands. 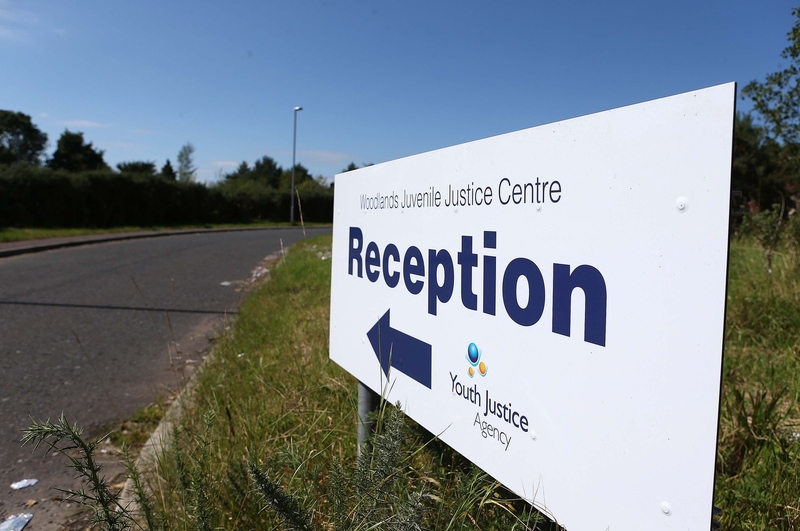 The DOJ commissioned review of the Youth Justice System in April 2012 stated that the practice of using the JJC as a place of safety for PACE procedures should be “reduced to an absolute minimum”. However the DOJ presentation outlined a breakdown of the number of times PACE had been used to send young people to Woodlands during the last three years. The presentation figures show that there was a significant rise in the number of times children in care were admitted to Woodlands JJC without being sentenced or convicted of a crime in 2013. Figures contained in the Youth Just Agency’s annual workload statistics for 2013 /14 show the number of young people in custody and subject to a care order has fallen from 49 in 2009/10 to 37 in 2013/14. However, Include Youth’s policy coordinator Paula Rodgers said the figures suggest a concerning trend of the same children in the care system being sent repeatedly to custody. She said: “What could be happening is that there are young people in residential care who display challenging behaviour and care staff may not be able to deal with it. “In a family home it may be dealt with differently, but in a care home it’s very often a quick phone call to the police and as a result you can find that these young people are detained in Woodlands. “They are also most likely struggling with lots of issues in their lives already. “We know from the young people we work with that there are multi-layered problems. “Everything from family issues such domestic violence to drug and alcohol abuse problems, as well as the fact that some of the young people have their own special educational needs. The DOJ presentation also provided a summary of issues emerging from meetings with a number of organisations including the judiciary, the PSNI and health trusts. Concerns included the fact that some police districts used PACE detentions more readily than others and that very often “geography and pragmatism can be a determinant”. The presentation contained figures on the geographical breakdown by PSNI station of all PACE detentions to the JJC of both children in care and children not in care. Using this data, we have reproduced the map below. 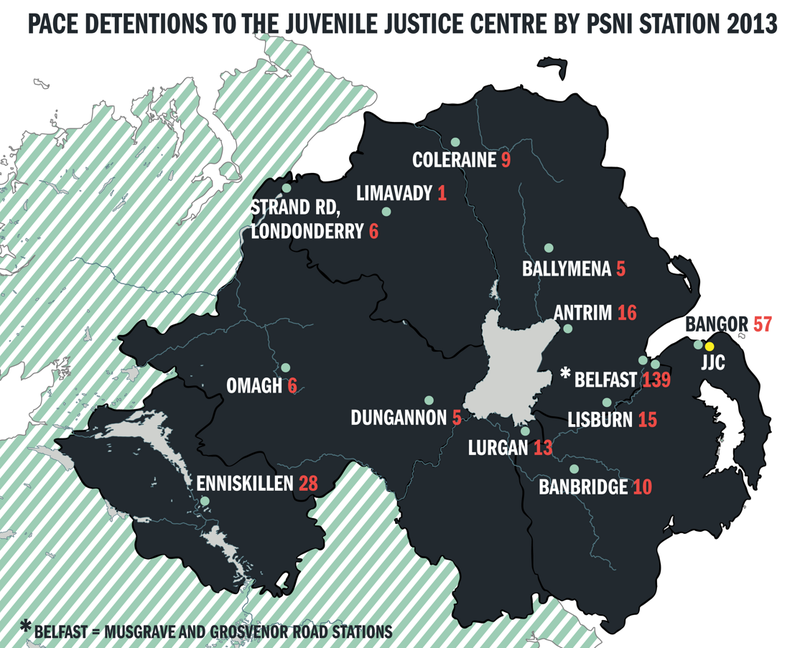 The figures show the number of detentions to the JJC in 2013 of young people not yet found guilty or sentenced for a crime (using the PACE order) by PSNI station. The presentation outlined that two thirds of PACE detentions come from PSNI Stations within a 20 mile radius of the JJC, while two thirds of looked after children admissions to the JJC are also from children’s homes within a 20 mile radius of Bangor. 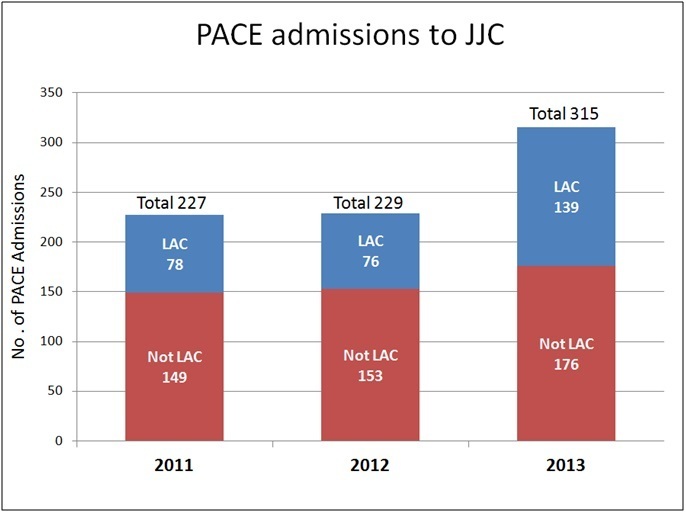 A Criminal Justice Inspectorate (CJI) inspection of Woodlands in November 2011 stated the need to “canvass a wide range of options to reduce the number of PACE admissions to the JJC”. A follow up inspection of the JJC is expected in the autumn. In a joint statement issued to The Detail the Department of Justice and the Department of Health said that work has been ongoing to implement many of the recommendations set out by CJI and other agencies. The statement said: “While pertinent to all children in contact with the criminal justice system, the setting and enforcement of bail conditions, and the use of PACE detention, has particular implications for young people from residential care homes with LAC making up a significant proportion of the custodial population of Woodlands Juvenile Justice Centre. “DOJ and DHSSPS have been working in partnership to address these and other issues, but it became evident that if significant and lasting change was to be achieved, there were a range of other important individuals and organisations that needed to be involved. “For the past number of months, bilateral meetings have taken place with several of these key stakeholders to gather information and seek perspectives from all sides of the issue. Paula Rodgers said that while Include Youth welcomes the news that both departments are working together to address this issue, the JJC should not be used as a “safe option”. She said: "Children should not be detained for welfare or care reasons. Custody is not the place for them and other ways must be found to accommodate these young people. “Include Youth is very concerned that custody is not being used as a last resort but rather as a way of dealing with young people who are displaying challenging behaviour.